If you think your specs are not making you look trendy then you need not worry. It's time to buy a pair of contact lens now. And if you are thinking that it is expensive then you are wrong. HappySale brings coupons and discount codes that will help you buy lenses at a low cost. You can buy lenses that suit you the most and from your favorite brand as well. Online stores give you a wide range to choose from which is not available when you visit a store. Here you can shop from different online stores. Moreover the offers are mind blowing. Like, you can get Buy 1 Get 1 FREE, 50% off and many other similar types. Now it’s time to put on your trendy look without the specs. So, your wait is over! Start shopping contact lenses today and save on each buy. Happy Contact Lens Shopping! Verified on 22/4/2019 .. Shop for uniquely crafted half rimmed frames with colourful temples. A right mix of design & comfort in these frames will change the way you look at eyeglasses. Buy 2 Vincent Chase Crayon's @ Rs 1499 only on a great collection of 700+ Eyeglasses. Verified on 22/4/2019 .. Lenskart gives you extra Rs 1500 off on progessive lens. This offers includes free bifocal lenses. Avail this amazing offer on progressive lens. No coupon code required to avail this offer. Gone are the days when spectacles were a blot on your face. In today’s fashion-conscious world, eyeglasses have a fresh meaning. From vibrant colours to unusual shapes, you can get a clearer vision and the latest runway trends together. Just choose from the huge range of frames on Lenskart.com, try them on yourself virtually, fill in your power and click Buy. There you go! Have them delivered to your home or office in just a couple of days. 2. A free pair of high quality eye glasses with prescription, Anti glare lenses (Upto Rs 1100) as per your choice. 3. Voucher worth Rs 500 applicable on sunglasses. 4. Complimentary dental consultation worth Rs 500 at Clove dental. 5. Full body checkup voucher worth Rs 2360 for eye care program members at Rs 949. 6. Rs 300 discount voucher by Lybrate for doctor's consultation. The best part about online shopping is the option of getting various contact lens offers from the multiple websites selling spectacles and lenses online. Plus, these stores offer free trail, frames and contact lenses for the first time users. If you do not like wearing spectacles, and want to avoid looking like a nerd, then wearing lenses is the only way out. These also help when you wear eye makeup. You need not hide your winded eye liner or that beautiful bronze gold eye shadow behind the lenses anymore. Buy lenses online and you will be rocking. 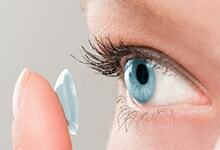 Lenses are available as monthly disposable ones or daily disposable ones. Make sure you know which ones you are getting and follow instructions on their disposal to the T. Buy the lens solution to store lenses and clean them using this solution before and after wearing the lenses. And, get BOGO offer on your lens shopping from stores like Lenskart.com, Amazon.in, LensBazaar and more. These lenses are also available as color contact lenses. This means, you can change yourself completely by wearing a new lens color for a change. This is true. You can look very different when you wear color contact lenses that are different from the original color of the eyes. Make sure you wash your hands before wearing and removing your lenses. Dirty, unwashed hands can cause an infection or irritation in the eyes. So, always use the solution to clean lenses and make sure your hands are washed and wiped with a soft cotton cloth or a tissue. Lenskart can save your day. Contact lens offers a beautiful sight to the eyes. Once you get comfortable wearing them, they will no more feel like a foreign object.